Special Order for 4", 5"
Special Order for 2-1/2", 8"
Special Order for 4", 5-1/2"
Special Order for 8", 4", 5-1/2"
Special Order for 8", 5-1/2"
Special Order for 8", 4"
Special Order for 2-1/2", 8", 5-1/2"
Flora Satin Perfect Bows are popular because you get a perfectly professional looking bow by just pulling a string of ribbon. Curl the remaining string or wrap it around the box for a great presentation. 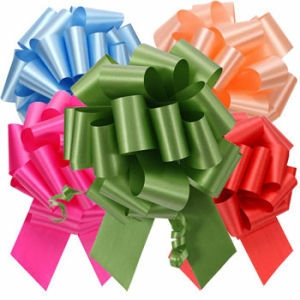 The bows arrive flat in a small box so they take up very little space at your counter and the shipping cost is minimal. For example 50 ea. 5-1/2 (PF9) bows come in a box that is 7 x 7 x 3 and weighs less than ½ pound. Order bows by the case. Each case has 50 bows.